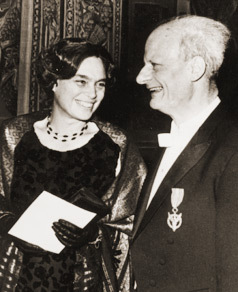 Hans Bethe's arrival at Cornell University as a refugee from Nazi Germany, at age 28 in 1935, launched the Department of Physics into the top rank. It was at Cornell, before World War II, that Bethe published his famous reviews of nuclear physics, and conducted his groundbreaking work on the theory of energy production in stars for which he won the Nobel Prize in 1967. During the war, Bethe was a key figure on the Manhattan Project as head of the theoretical physics division. After the war, he brought some of the most outstanding young physicists from Los Alamos to Cornell, in particular, Richard Feynman and Robert Wilson. Under their leadership, Cornell moved into what is now called high energy elementary particle physics, a field in which Cornell remains on the cutting edge. That Hans Bethe has devoted virtually his whole career to Cornell has been of inestimable value to the Department and to the University. 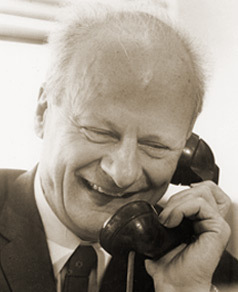 Hans Bethe was born in 1906 in Strasbourg, Germany. He attended the University of Munich, studying with Arnold Sommerfeld, and after receiving his degree in 1928, taught at Frankfurt, Stuttgart and Munich. In 1930 and 1931, he received fellowships first to Cambridge and then to Rome where he worked with Enrico Fermi. Bethe's career spans the evolution of nuclear physics as we know it today. He has made contributions to almost all phases of the exploration of nuclear interactions and nuclear forces, but his scientific accomplishments go far beyond this. He produced the first major paper on the theory of order-disorder transitions in alloys, and his 1947 calculation of the Lamb shift paved the way for the revolution in quantum electrodynamics. In the decade following World War II, Bethe and Feynman and their students played a central role in developing quantum electrodynamics, work for which Feynman shared the Nobel Prize. From 1945, until his retirement from the Cornell faculty in 1975, Bethe trained and inspired a large number of graduate students. Many have gone on to become internationally known scientists, among them Freeman Dyson. 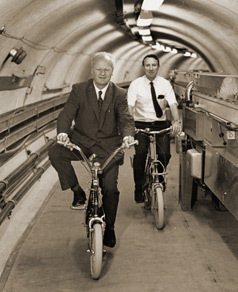 Bethe and his co-workers published important work across the whole spectrum of physics. Even today, in his nineties, his unique mastery of such diverse subjects as thermonuclear processes, shock waves and neutrino reactions have kept Bethe at the forefront of research in astrophysics. Bethe's impact transcends the Cornell Physics Department. The distinction of astronomy at Cornell owes much to Bethe's inspiration and initiatives. He has been an advisor to several United States presidents on national security policy and, since World War II, has played a leading role in the public debate about nuclear weapons, defense policy and nuclear power. He was one of the founders of the Federation of Atomic Scientists and was a member of the original Board of Directors of the Bulletin of the Atomic Scientists. In his public role, Bethe's position has been that of a responsible scientist and a man of conscience eager to contribute his special knowledge to the public discussion of the great issues of our time. Hans Bethe is a remarkable combination of a truly great scientist who has also made major contributions in the public service of his nation.